We have a selection of luxurious chauffer driven vehicles that will turn heads from when you depart from home to arriving at the ceremony and reception. Available for weddings, civil partnerships, anniversaries or any special occasion. 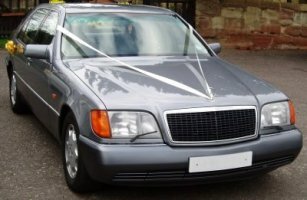 What could be more perfect than a stretch limousine to make your Special Day just that little more special. A beautifully prepared car with plenty of room for the bride and bridesmaids etc. A fitting vehicle boasting a combination of air conditioned space and modern styling with the traditional elegance of leather and cut glass lead crystal, all designed to provide a fantastic memory of your special day. Our White and Pink Super-Stretch limousines each seat up to 8 passengers for your wedding party. 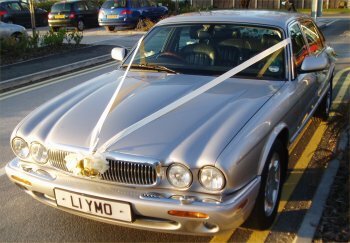 Our Jaguar Sovereign, Mercedes "S" Class and Daimler/ Jaguar are long wheel base executive vehicles, which means they have larger rear doors and extra leg room for bride/ bridesmaid dresses.